What is the Red Army? The Red Army was the name given to the force of the former USSR. 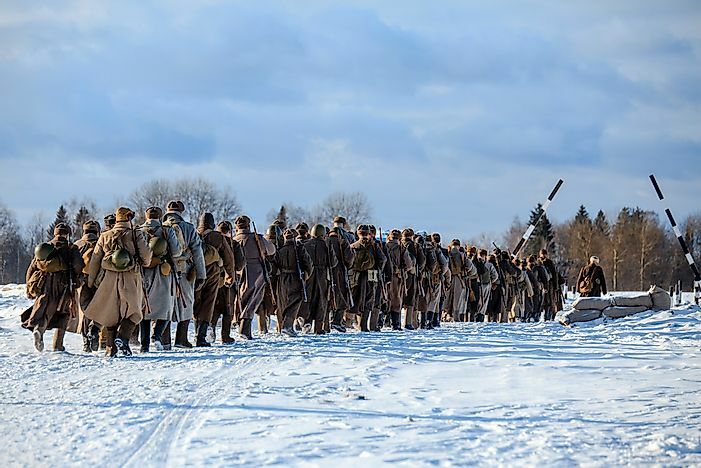 A modern day reenactment of the Red Army in WWII is seen here in Russia. The Red Army was a Russian army which was formed predominantly by workers and peasants. It was created after the Russian Revolution in 1918 by the Council of People’s Commissars. The color “red” was used to refer to the army since it symbolized the struggle for release from oppression. The Red Army was often referred to as the Reds. During the process of recruitment, citizens volunteered and were admitted if they were 18 years of age and above. Those who were successfully admitted were guaranteed. The formation of the red guards was necessitated by the collapse or near fall of the Imperial Russian Army who had been overpowered by the Germans and was then fleeing for their lives. The Red Army’s name changed to Union of Soviet Socialist Republics after the 1917 Bolshevik Revolution. The Red Army existed from 1918-1946. The commander cadres received their training from Nicholas General Staff Academy in Russia. On the other hand senior army officials such as the senior and supreme commanders got training at the Advanced Courses for Supreme Command. Red Army’s well structured army training was one of the factors which led to its success. Another strategy which was used for their advantage was their ability to convince some of the White Guards to cross over to their side hence providing excellently trained and experienced officers to their military squads. The war which was exclusively fought by the Red Army was the Russian Civil War. This war was between the Bolsheviks and the Old Russian Army Remnants. The two opposing groups became known as the Red Guards and the White Guards (Whites) respectively. Right after their 1919 victory, the Reds set on to drive away the White Guards from Russia. They succeeded in doing this and the Civil War ended in 1920. During the war, 17 million people died from either from famine, disease or the war. Furthermore great atrocities were committed at the time. At some point the Whites had to flee for their lives; about 150,000 of them by sea. The Red Army outnumbered and outsupplied the Whites during the war. As a result of the war, the economy of Russia was greatly damaged. On the other hand, nations such as Lithuania, Finland, Latvia, and Estonia received acceptance as independent states. One notable explanation for the success of the Red army was the presence of military command, unity, and strict obedience to orders. They also took advantage of the overreaching line in battle. The major drawback faced by the Reds was the little support which they received from the neighboring countries and internationally. The Whites were supported by the English, Americans, and Siberia. A major threatening force at the time was the First Calvary which was led by Semyon Budenny. Later on, Budenny became USSR’s Minister of Defense. Then the second challenge was the fact that most of the members of the Red Army were new to war at the time they were called upon to serve.